State of the Art 13 quilt show is the annual celebratory exhibition of Queensland Quilters Art Quilts member’s talents. 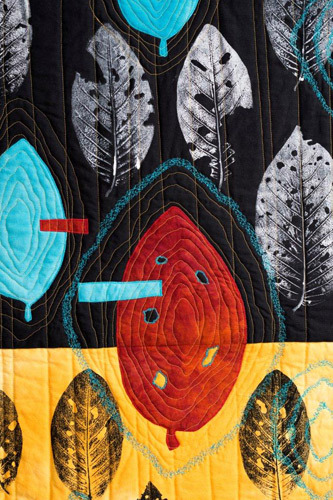 Selected by Lisa Walton, a nationally and internationally renowned quilt media artist, the art quilts selected highlight the diversity of techniques and subject matter art quilters are exploring today. A means of social and personal commentary by the artists, they invite us to see ourselves and the world in a new way. Image: Sue Dennis, Shake the tree (detail) 2012, hand dyed and hand painted cotton fabric, fusible web, paint, batting and threads. Courtesy of the artist.